UK top 6 Rivers | DBP MAGAZINE ONLINE The World's Best Free Whitewater Publication. Hidden in a deep valley in Devon, the roads leading to the classic section of the upper dart are as highly graded as the waters themselves! From the first ledge drops, through the mad mile, to the the takeout at Newbridge, the Upper Dart is whitewater paradise. The grade of the river never drops below 3, with beautiful continuous whitewater punctuated by classic set-piece rapids such as Euthanasia falls and surprise surprise. This Yorkshire gem is all about altitude lost, as quickly as possible. From the put in you immediately go straight over the first fall, and they just keep getting bigger until the river finishes with a bang at Upper Kisdon Force. In the few miles in between, there is more than 4 large waterfalls, and chunky rapids. This river is best enjoyed when the water is a solid brown colour, and with a solid boof! The Welsh classic. An incredible river in an incredible place. Continuous G5 rapids in a gorge unparalleled in beauty. 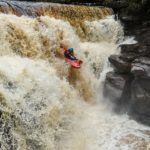 A rite of passage for many UK whitewater boaters, it has legends surrounding it. Once people are hooked by one lap, they inevitably come back for more and more. Every Welsh paddlers best friend. This section is short enough for a boat to be easily carried back up, allowing laps after laps after laps. It also never gets too high, just more fun. Breaker is a deceptively powerful little drop, and as many paddlers have found out, unpleasant to do on your face. The closest you get to alpine paddling in the UK, once you start it is non stop until the end. In high water it is a game of merely surviving the non stop holes! Beneath the foot of the tallest mountain in the UK, one of the UK's best whitewater rivers awaits. Tumbling out of the unrunnable mess of boulders that is Steall gorge, the river surges through boulder fields and gorges. The river does have many (not so hidden) dangers, with horizon lines galore, with falls and gorges that demand respect lurking around every corner. Possibly the most photographed river in the UK! Driving down the river is an amazing experience, it was used in the James Bond film "Skyfall". The river is even more amazing than its surroundings, with amazing pool drop rapids and falls. Right Angle falls is many UK paddlers first introduction to "bigger" waterfalls, and sees many runs upside down and back too front. Don't be lulled into a false sense of security though, in high water this river is incredibly full on.